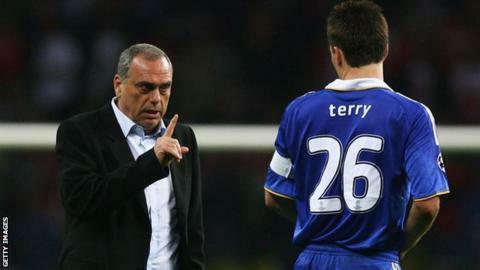 Former Chelsea manager Avram Grant has questioned the Football Association's decision to charge John Terry with using racist language. Terry denies the allegation he used "abusive and/or insulting words and/or behaviour" towards Anton Ferdinand in a game against QPR on 23 October 2011. Terry and Chelsea chairman Bruce Buck were at Wembley for the second day of the disciplinary panel hearing. 23 October 2011: Terry releases a statement denying he made a racist slur against Ferdinand during Chelsea's defeat at QPR after videos circulate on the internet. 1 November: The Metropolitan Police confirms it has launched a formal investigation into allegations of racist abuse of Ferdinand by Terry. 21 December: The Crown Prosecution Service announces Terry will be charged with racially abusing Ferdinand. 1 February 2012: District judge Howard Riddle orders that Terry should stand trial in the week beginning 9 July - after Euro 2012. 3 February: Terry is stripped of the England captaincy by members of the 14-strong FA board, without consulting manager Fabio Capello. 8 February: Capello resigns as England manager two days after, criticising the decision to strip Terry of the captaincy. 13 July: Terry is cleared at Westminster Magistrates' Court of making a racist insult to Ferdinand. 27 July: Terry is charged by the FA. 24 September: FA independent regulatory commission into the case begins. "Nobody thinks John Terry is a racist. The FA need to leave it," Grant said. "I think the message was clear and I don't think they need to charge him. For the FA, the more important thing is the message that it will not have racism in sport." Terry was cleared of racially abusing fellow defender Ferdinand in a high-profile court case in July. The FA investigation followed the criminal proceedings. Ferdinand gave his testimony to the FA independent regulatory commission on Monday morning, where Terry was also in attendance. Neither Terry nor Buck commented as they arrived at Wembley on Tuesday. Terry left after 1300 BST and the hearing could last until Wednesday. Terry announced his retirement from international football on the eve of the hearing and Grant, who was his manager in the 2007-08 season, expressed his surprise at the decision. Grant told BBC Radio 5 liveDrive: "John likes to fight and he's very passionate about the national team so I was surprised. But he's not a child, he knows what he's doing. "One thing I must say about JT is that he's not a racist, that's for sure. He's a good man. "He respects everybody, he's good with people and I was very surprised that people thought bad things about him." The independent panel are examining the FA charge against Terry, which includes an accusation that he also used "a reference to the ethnic origin and/or colour and/or race" of Ferdinand. The commission requires a lower burden of proof than applies in the English and Welsh courts. A similar hearing involving Liverpool striker Luis Suarez last season took four days and led to the Uruguayan being banned for eight matches after he was found guilty of racially abusing Manchester United's Patrice Evra. Terry left Wembley at the end of the first day of the hearing at 14:50 BST having been represented by George Carter-Stephenson QC, who defended him in court two months ago. At July's trial, Westminster Magistrates' Court heard accusations that Terry had insulted Ferdinand, describing him as "black" and using extreme sexual swear words. In reaching a not guilty verdict, chief magistrate Howard Riddle stated it was "possible that what was said was not intended as an insult but rather as a challenge to what he believed had been said to him". But the FA only has to prove its case "on the balance of probabilities" and the use of racist language is a breach of the rules. On Sunday, Terry, who won 78 caps for England, said the FA's decision to pursue charges against him after being cleared in court meant his position with England had become "untenable", a claim disputed by FA general secretary Alex Horne.